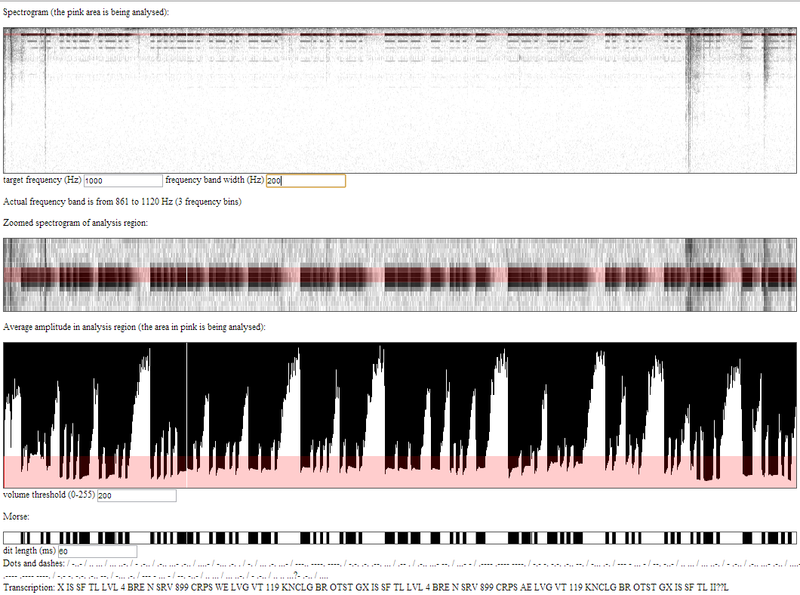 I have been working for a while on a tool to “listen to” and transcribe Morse code. I’ve been wanting to do it for ages and considered a variety of ways, but with more browsers supporting the Web Audio API the time seemed right to give it a go. Ultimately, the tool will be integrated into my Morse code trainer to listen to students practising the segments of Morse code in that tool and let them know if they are doing it well enough. For now though, the Morse code transcriber is just an alpha-release stand-alone tool which only works properly in Chrome (I should be able to make it work in Firefox as well). I recently came across a website that is transmitting Morse code as part of some marketing campaign I guess. I think the transcriber would be very useful to people who want to know what it is saying. It actually seems to work quite well! You need to use the transcriber with the target frequency set to 1000Hz and the volume on your computer right up. To get it to work reliably you really have to fiddle with the settings. I’ll sort out an auto-calibrating version as soon as I can. I’ll post some technical details of how it all works later, but I just wanted to let people have a go with it for now.